Changing times . . . Caldwell Contracting can now fell trees for logging and chipping. Photos: Supplied. Caldwell Contracting has quality gear, quality drivers and always delivers a quality job. Based in Edendale,the Caldwell family has been servicing the community’s cultivation and grasslands requirements for more than 20 years. Looking to offer more to their customers, the family has branched out into logging/woodchip and water carrying services. Business manager Bevan Caldwell said while the core of the business has stayed the same, they had identified a need for wood chip in the area. About three years ago, a big, selfpropelled chipper was bought, and Caldwell Contracting can now fell trees for logging and chipping. With the wood chip services, Caldwell Contracting can do calf sheds and wintering barns from start to finish. 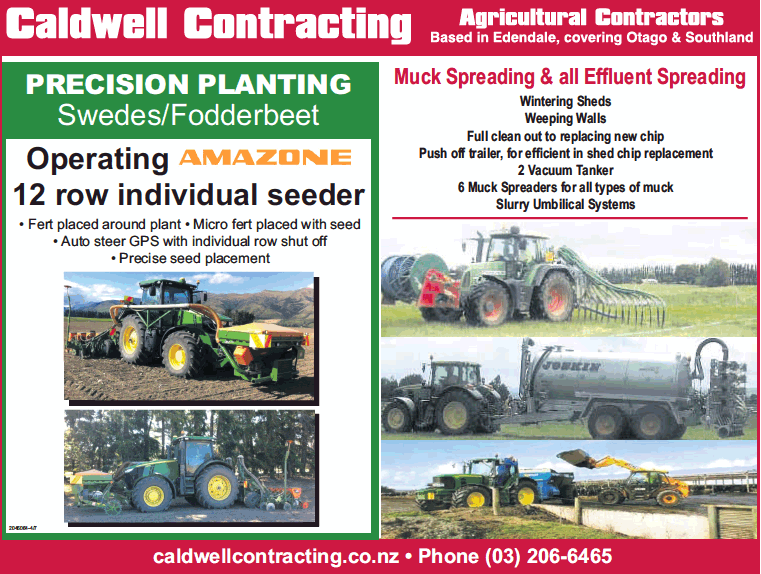 Expanding this area of the business, six muck spreaders — along with small diggers, telehandlers and two umbilical systems — mean the Caldwell team can clean out the shed or barn and replace the wood chip. Last season, a new push-off trailer was bought, which means wood chip is easily replaced inside barns. ‘‘It speeds things up and makes it more efficient,’’ Bevan said. It was around the same time the family looked into water carrying, as director Alan (Jock) Caldwell saw a need for it in the community. The drinking water is sourced from different supply points and can be delivered in an 18,000L carrier or a 28,000L carrier. Caldwell Contracting delivers all over Southland and right up to South Otago. The cultivation and grassland services offered by Caldwell Contracting continues to upgrade, so the family and team of 40 (in peak season) can better service customers. These days Caldwell Contracting runs two self-propelled Jaguar 950 harvesters and a Jaguar 870. They also have weigh bridges for weighing grass on farm and run low-compaction tractor and trailer units, Bevan said. Caldwell Contracting runs two McHale Fusion 3 Plus balers, which offer net replacement plastic options as well as net options. The plastic-on-plastic option means there is no chance of air getting into the bales, meaning the risk of damaging the quality of the bale is reduced and recycling is made easier, Bevan said. Caldwell Contracting’s cultivation division has a 12-row precision planter which has fertiliser and micro-fertiliser options available. As well as fodder beet, Caldwell Contracting has been involved in swede trials in the past, and was planting a lot of swedes using the precision planter and getting great results, Bevan said. ‘‘We’ve seen some great results with it, with good seed placement and depth control,’’ Bevan said. Bevan, Alan, Doug Caldwell and the friendly office staff are always manning the phones, so make sure the job is done as efficiently as possible and to top quality every time. ‘‘It’s about getting in and getting the job done so everyone is happy,’’ Bevan said. Give the Caldwell family a call, and get your farm job done efficiently and done right.